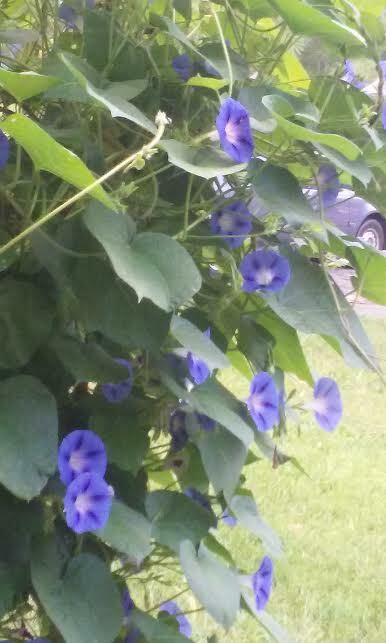 This entry was posted in Uncategorized and tagged flowers, morning glories, vines by luckyotter. Bookmark the permalink. I love the bright blue color. The photo doesn’t even do justice to it. Beautiful! Do you know what variety they are? It was on the package, which I no longer have, but I can’t remember what they were called. I love the bright blue. Some are more purplish — almost like hydrangea blooms (another plant I love). Just curious. The ones I grow on my deck are called “Heavenly Blue,” and they are beautiful, but they look different from yours. Might be a regional variation or something. Sometimes the same flower can look different when grown in different climates, or different types of soils. No, I think it was a different name. I can’t remember it. I’ll try to find out though.